Picture a young professional gymnast during competition demonstrating complex actions. The quality, variety and difficulty of their movement patterns is what puts the audience in awe. On the other hand, think of an elderly person shuffling through the grocery aisles. Parts of their body seem to be frozen, the steps are slow, and often they are hunched over due to years of tension, poor posture, and exposure to gravity. This is an example of the body sacrificing movement and flexibility for stability and balance. These days, we happen to live in a “flexor-dominant” world, which means we spend most of our days bent forward in some way. Spending hours peering down at our phones, sitting at computers, and driving, slowly causes wear and tear on our joints and connective tissues. We are slowing wearing away at our “up rightness”, and creating an unnecessary relationship between poor posture and chronic pain conditions due to the abnormal strain being put on muscles, ligaments, and joints. The average human head weighs between 10 and 12 lbs that with healthy posture, is balanced on the neck and shoulders in a way that allows the weight of the head to be distributed evenly over the natural curvature of the spine. This neutral position allows for pain free range of motion, easy breathing, and proper circulation. However, in our flexor dominant world, we find our heads inching forward and adding unnecessary weight to our spines. A study by Kenneth Hansrag, MD, in New York at Spine and Surgery Rehabilitation Medicine, stated that for every inch forward the head moves from its ideal gravitational center, it feels as if it weighs an additional 10 lbs. 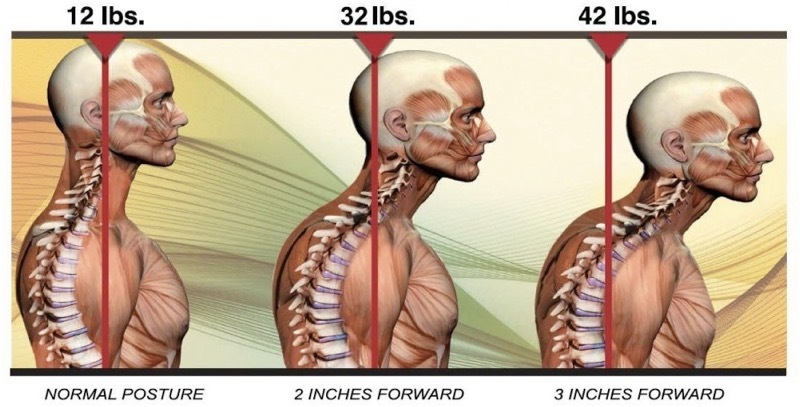 If your posture allows for your head to flex forward 3 inches from neutral, that’s an extra 30 lbs of force on your spine, leaving your neck to carry 42lbs of stress. Imagine carrying a 10lb weight close to your body, but then extending your arm straight out. The weight doesn’t change, but your brain’s perception of how heavy the weight is increases, and so does the effort required by your muscles, and joints. Erik Dalton, Ph.D., has written a great article called “The 42 Pound Head”, where he discusses his research on how poor neck posture and slouching can also cause negative symptoms other than upper back pain, muscle spasms and headaches. Some of these side effects include sluggish digestion, shortness of breath and decreased lung capacity, increased blood pressure, poor sleep, osteoarthritis, and spinal pain. How can you tell if you have forward head posture? If you drew a straight line down from the center of your ear, it should also run right through the center of your shoulder. If it doesn’t, chances are you have degree of forward head posture. When you hunch forward with your neck, and slouch over, you are causing some muscles to work incredibly hard all day, while some get weaker. Massage therapy can help correct posture with regular treatments, and at home stretching. With regular treatments, massage can decrease tension, scar tissue and knots that are encouraging poor posture and aching muscles. Correcting over lengthened or tightened muscles allows for increased pain free range of motion, balanced posture, and relieves you of carrying an unnecessary extra 42lbs of stress.